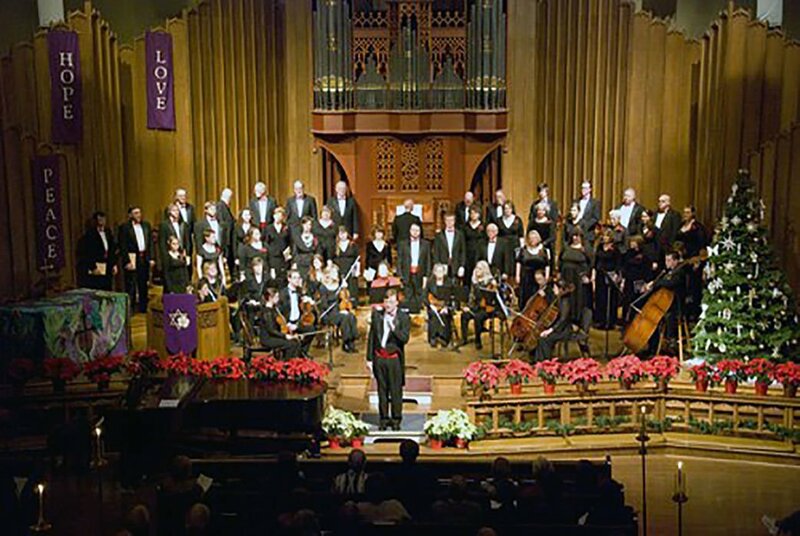 The Corvallis Repertory Singers also plan a "Messiah" sing-along as a part of the weekend concerts. Steven Zielke, the artistic director of the Corvallis Repertory Singers, has selected a Vivaldi favorite as the centerpiece for the ensemble's holiday concerts this weekend. Steven Zielke, the artistic director of the Corvallis Repertory Singers, has a long memory for memorable music — but maybe some of the members of his ensemble have him beat. The centerpiece of this year's Repertory Singers' "Candlelight & Carols" holiday concert is Vivaldi's Gloria in D major, a piece that he's loved since the days when he was a vocal student in Kansas. When he added it to the program for this weekend's shows, though, he was certain that it was the first time the Repertory Singers had performed the work; in fact, that's what the early publicity notes for the concerts indicate. But, Zielke said in an interview with The E this week, his memory has since been refreshed: "One of the members reminded me that we had done this 15 or so years ago." Regardless, Zielke doesn't think audience members will mind: "I love the Vivaldi," he said. "It's a brilliant piece," with a simplicity that seems right for the season. And he loves the story behind the piece as well: Zielke said Vivaldi wrote it for the all-female music ensemble of the Ospedale della Pietà, a home for abandoned children where the composer worked — and where he created most of his major works. "He turned these girls into amazing musicians at a time (the early 1700s) when the world thought only boys should be making music," Zielke said. Zielke's memory may be a bit foggy about the first time the Repertory Singers performed the work, but he vividly remembers his first exposure to it. He was a college school in Wichita, working as a section leader with a church choir, when the director programmed the Vivaldi Gloria. "It was all new to me," Zielke said. "I had never heard of it." But he remembers thinking: "Wow, this is amazing. Other people should know about this piece." Ah, the charming naivety of youth: Of course, as he quickly learned, other people knew about the piece, which has become a holiday staple for a number of reasons: It's about the right length for a holiday concert, and the music, while relatively simple, is gorgeous. It also puts the spotlight on three soloists: Sopranos Emma Nissen and Lorissa Zen and mezzo-soprano Caitlyn Douglass. The weekend concert includes an unusual twist on another holiday staple, Handel's "Messiah." The concert's second half opens with what's being billed as a "Mini-Messiah Sing-Along." The sing-along, suggested by associate conductor Raymund Ocampo, features four of the piece's best-known choruses (including, of course, the "Hallelujah"), and the audience will be invited to sing along with the Repertory Singers. Two hundred copies of the score will be available for audience members. The ensemble's four section leaders (Sandra Babb, Leah Tomlin, Bryce Tomlin and David Zielke) will take turns conducting each of the choruses. The program also includes a variety of carols, includ two Dan Forrest arrangements, "The First Noel" and "See Amid the Winter's Snow;" Dale Warland's "Wexford Carol;" Eleanor Daley's "Jesus Christ the Apple Tree;" Stephen Mager's "Come, All Ye Shepherds;" and Rene Clausen's arrangement of "O, Holy Night," the traditional holiday concert closer for the Repertory Singers. Zielke said he has some surprises in store as well. This concert will be performed twice, once on Saturday night and once on Sunday afternoon, continuing an experiment of sorts that the Repertory Singers launched with last year's performance of "The Messiah." The ensemble also plans two performances of its April show, which will feature the concert version of Meredith Willson's "The Music Man." HOW MUCH: Tickets are $25 for floor seating, $18 for balcony seats. They're available in Corvallis at Grass Roots Books and Music, Troubadour Music, and Susan’s Garden & Coffee Shop (formerly Schmidt’s Garden Center); and in Albany at Sid Stevens Jewelers. They can be purchased online at this site: https://repsing.org/tickets/ or at the door, if seats remain.